Fvwm - Desktop screenshot - impressive! Discussion of this fvwm screenshot. A small video with xvidcap. Perhaps someone can try on system Bsd. Last edited by aleunix; 4th June 2008 at 05:40 AM. Even Mac OS X or E17 looked poor comparing to that configs. Also arsen.gentoo.pl has some nice setups too, also FVWM forums has lots of nice FVWM configs. I like this screenshot of arsen. they look nothing like the original fvwm look which is inspired by mwm(motif wm) and cde. After I found these screenshot i'm thinking perhaps i will use only fvwm custom rather than Xfce. FVWM is the king of all other WMs, you can turn it into whatever you want, fluxbox, kwin, pekwm, its just matter of time and FVWM configuration, you can tune EVERYTHING, but it takes time and knowledge. I'm surprised too, not really a WM nut but this is rather nice looking. Gotta try it out soon! are those really screenshots of fvwm? Stable release is 2.4.20, 2.4.0 was released Jul 3rd, 2001. There is a fvwm2 2.4.19 available as port/package. So: do not compare features. the first screen shot in the tread I find somewhat impressive compared to a lot of the more typical (if there are any) FVWM screens I've seen in passing, but the menu fonts are leaving to be desired imho. I've never used FVWM and have, generally turned my noise up at many TWM related window managers -- during the brief time I used TWM during my 'wm collector' spell, I really hated it !!! I've been interested in replacing KDE (again) for some time now. So after reading this thread I think I'll give FVWM 1.24r or 2.x a try and see how long it takes to corrupt it into my work flow ^_^. If any thing tunes up, I'll post a screen in the fbsd screen shots thread. The port of fvwm2 2.4.19 is available on Openports.se. Love FVWM myself, very configurable and easy to use. Personally, I don't have the patience to deal with fvwm. It takes time to configure. I just use KDE. It's easy to install and use, and the default look, at least in 4.1 Beta 1, is quite nice. Does menumaker work well with fvwm? I used it with icewm (which I'm using now), and it really is nice. 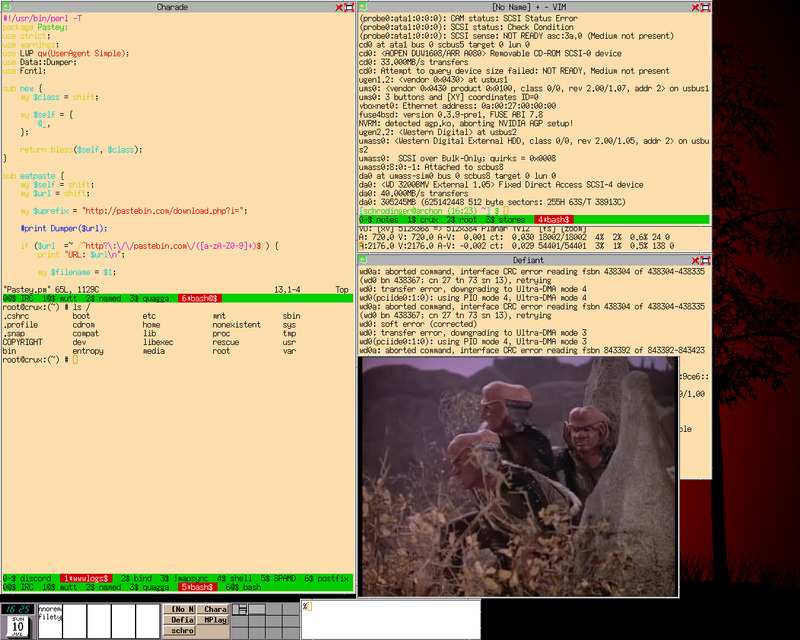 here's a screen shot of my OpenBSD box w/ Fvwm2. i keep my shyt simple. no frills. i'm all bout the image and using the keyboard instead of the mouse for pointer control. got it? one more screen shot for ya's. openbsd is splendid. perfect. exactly what i need and want in any os. love the art. love the music. no one else can touch openbsd in this respect yet.